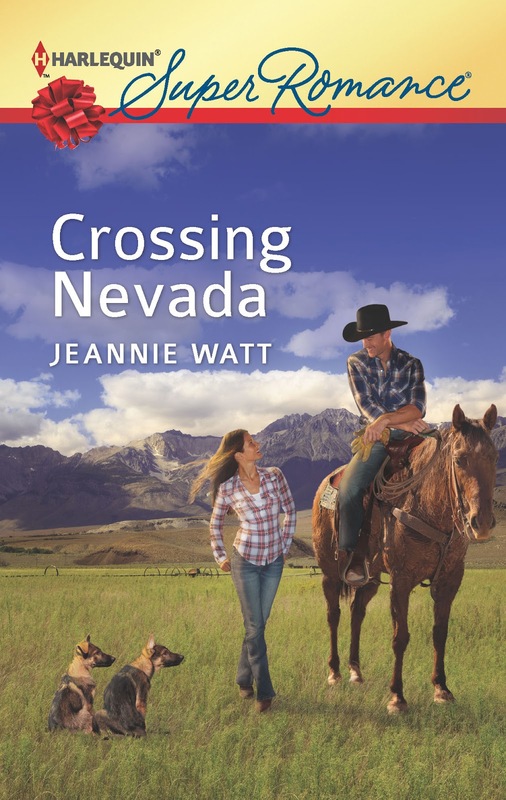 In my December book, Crossing Nevada, the heroine learns to sew as a coping mechanism to reclaim her life after an assault. It wasn’t something I’d planned when I first outlined the book, but I needed a way for the heroine to connect with the hero’s daughters and sewing seemed like an excellent way to bring everyone together. I used to sew a lot. I made clothes for my kids, for my husband, for myself, but after selling my first book in 2006, I had less free time, so my sewing machine—once the center of my world—began gathering dust in the basement. Then a friend invited my husband and me to a Dicken’s Christmas dinner and we had to wear Victorian costumes. My husband borrowed a costume, but I had to make mine. It was a rush job and nothing I was too proud of, but it felt good to be sitting at my trusty Kenmore, grinding out a garment. I decided that I needed to squeeze more sewing time into my life. But I wanted to sew something interesting, so I made a command decision and told the family we were going to Dicken’s Fair in San Francisco. It took me six months to make four costumes in my spare time, including two wool frock coats. Just as with my writing, there were times when I wondered if I'd ever get done, but then, suddenly, it was all over. I was done. And I needed a new project. Something that didn't involve taffeta or crinoline--at least for a while. I decided to take a break from the Victorian era and move forward about a hundred years--to the 1950s..
I’ve been collecting old patterns and now I’m going to make a few. 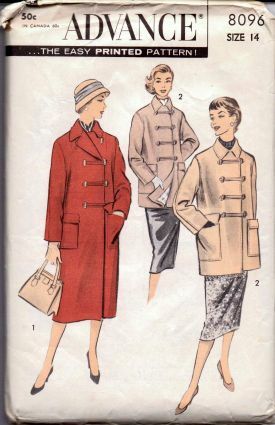 My first is a coat from 1956. I bought some plaid wool that looks 50ish and plan to start sewing next week. Hopefully I'll be done before winter is over. When I'm done with the coat, I'll start on this great dress from approximately the same time. If it doesn't look ridiculous, I may wear it to RWA Nationals. I'll know in a month or two whether it's worthy of a public showing. I'll post a picture or two in a future blog--even if the projects don't turn out. Whether they do or not, it'll be a learning experience and that's exactly what I'm looking for. wow, that Victorian dress looks beautiful Jeannie :) Our museum here has an exhibit going on that is showing clothes that were used here in the islands from the 40s through the 60s (maybe there were some older, not sure). What a kick to look at all the prints and sundresses and aloha shirts! Don't know how you find the time to sew, write, teach, take care of your animals and everything else you do! I love to sew, but I don't think I'm up to your level of expertise. I'm impressed. Jeannie, I love your dress. It's gorgeous. Thanks for sharing the photo. It must have taken so much time!!! 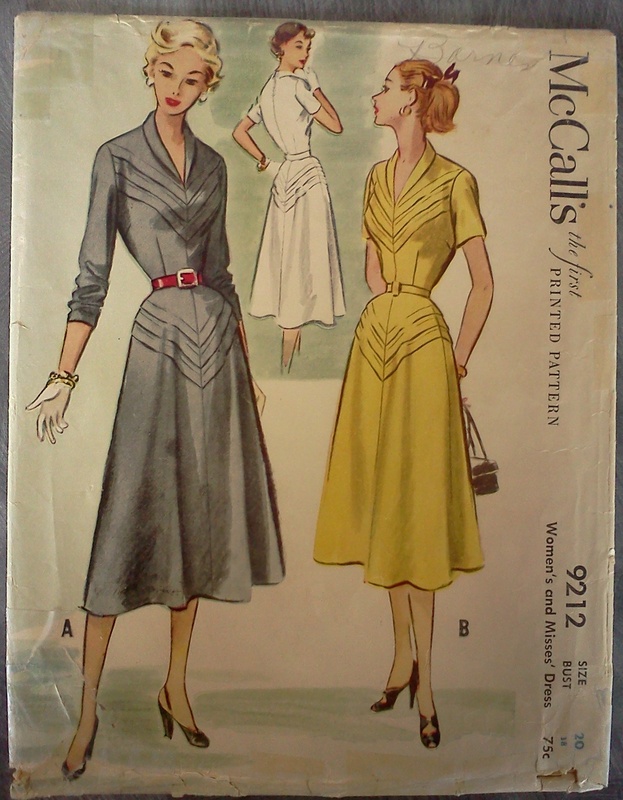 I also like the retro dress pattern you plan to make. Definitely post photos when you are finished. I'd love to see how the dress and coat turn out! Jeannie, these are so gorgeous and fun! I do hope you'll be wearing the dress at National - would love to see it in person! Jeannie ~ I've said it before but I don't know how you manage to fit everything into your life. You are so talented, organized and ambitious. What an unbeatable combination! I love your Victorian outfits. I really love both of the 1950's patterns you picked out. Are you making the full length version of the coat? The dress looks like it might pose a few challenges with all the intricate V's on it. I'll be watching for the results. I envy your expertise. I sew just well enough to think I can do it, and end up getting frustrated. I do have a couple of dresses I made when I was first married. And Halloween costumes for the kids. I need to repair the seam on a sweater I just bought my husband. It's hard enough finding sleeves long enough for him (he's 6'3" and the 3/4 sleeve look doesn't work for him). I'll have to open up his Grandfather's sewing machine. Right now it's a table that usually holds pictures. Hi Mary--As far as expertise goes, I found it's a matter of one seam at a time. That and looking up a lot of stuff in books and online. There's so much information out there now. Hi Mary--The Victorian dresses didn't take that much time. I think each one took about a week. The wool frock coats, the men's pants, men's shirts and vests took time. I really enjoy tailoring, but it's time consuming. Hi Kris--I hope the dress turns out, too. I really want to wear it. Hi Rogenna--I went years without sewing and sometimes wondered if I'd ever get back into it. It's good to have a sewing machine around, though. Every now and then something needs fixed. I'm impressed that you made your boys's clothes. Hi Kaelee--Thank you for the compliment. I must admit that the V's have me concerned. I'll take it slow. Kristina--"Grandfather's sewing machine" sounds intriguing. Is it a treadle or one of those cool ones in a cabinet? Lol at 3/4 length sleeves on your husband. Sewing is one thing I have never been very good at doing. I've always wanted to make a quilt, but my sewing is just not good enough. And now I have severe RA and I don't think my hands would cooperate for that much work. My mother used to make her own patterns and sew all kinds of things and they always turned out great. I never could figure out how she did it. Good luck with your sewing projects, I'm sure they will turn out beautifully. Jeannie, Grandpa's sewing machine is in a cabinet that folds up like an end table. I had to add that in 1995, I made a 49ers bra to wear for the Superbowl. Back then they didn't have officially licensed NFL lingerie. I had to make my own. I wonder if it still fits, two babies later. I'll find out in two weeks.